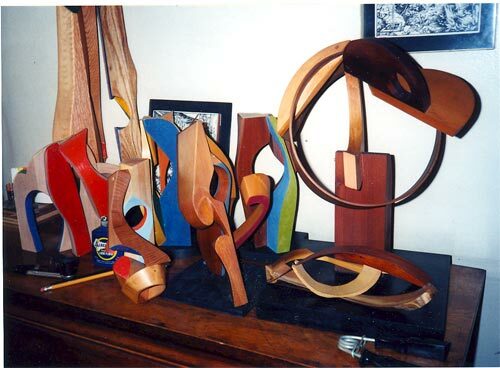 For 36 years Ralph Martel has lived in the same duplex apartment in the West Village, with a studio in the same building, working quietly and meticulously, so that by 2006 almost all surfaces, including the edges of the floor are packed with his graceful sculptures and paintings. His loft and his studio literally teem with his sculpture. The dining room table, the edge of the floors, the walls— teem. It reminds me of photos of when they first entered the teeming rooms of Tutankhamun in the Valley of the Kings. Ralph Martel is one of America’s undiscovered brilliant artists, whose work will last. He has that Caldor factor: always working with his hands to create pleasing shapes and curved surfaces. Everywhere you turn in his house you run into things shaped and fashioned by Ralph: desks, bent forms, wall hangings, book shelves, et al. 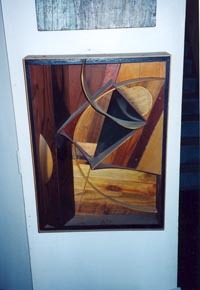 But, starring in this Ralph-created mix are his sculptures in wood, many of them free standing, and many placed on walls. He has built large outdoor pieces, even experimented with designing fountains, but it is in the fairly small, contained, intimate shapes that now adorn his house that he has found his mastery. His sculpture features many types of wood, ranging from scraps rescued from firewood log piles to elegant mahogany, teak or walnut. Some parts of the sculptures sometimes have wood left with the bark in place polished wooden surfaces, with sudden out-curves of planed wood that he has rolled and shaped in his workshop. At its best, its pure thrill. 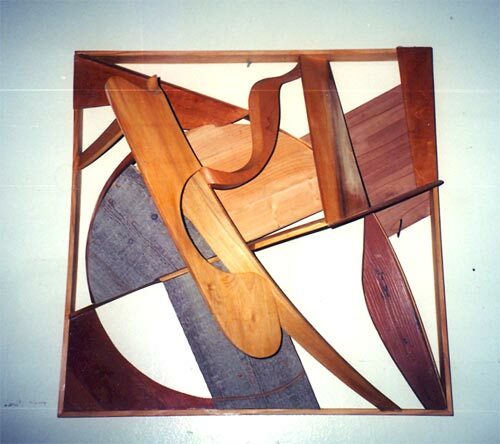 He also began creating works in intarsia, a form of wood inlayed into wood from the Renaissance, in the early and mid 1980s. Really beautiful works, using a variety of woods, including cherry, mahogany, oak, poplar, rosewood, teak, maple, American walnut and butternut. After his revelation in ’86 Paris, his worked progressed in beauty and quality until this very moment in the history of time, 2006, the surfaces of his life are packed and ready to be savored. He is a difficult artist. Hardened, as they say. A curmudgeon. Not inclined to tolerate smart asses. But to his friends he is always a generous and helping hand. Who knows what will last? It’s like a sequence of sine waves, up and down, to lift up artists for a century or so, then lets them sink for the next. Even Titian is on the wave. Ralph Martel will last. His sculptures particularly are destined for the walls of the civilization that survives the Bush era. He’ll get his due and his day. But, it would be good and even just for him to have a major show in New York City right away, this year or next. Gallery owners! Museums! Collectors! Go to Ralph Martel. You’ll be sorry if you don’t. You have to be there to taste the full range of his art. To savor and to select from the prolificity. Because someone is going to become very wealthy when the world at large discovers Ralph Martel and his rich and wonderful legacy of sculpture, paintings, not to mention his research undertakings in the field of art theory which, even if he were not an important artist, would give him his proper place.